I’ve had a go-to pancake recipe for a while that I love. My kids gobble them up, they come together quickly and I make dozens of batches thru the year. Today I was pondering what to do for dinner and (thanks to a breakfast for other meals conversation I had earlier in the day) I got the hankerin for a nice fluffy stack of hotcakes. I decided to deviate from my normal recipe mostly because I had some buttermilk in the fridge that needed to get used up. So, I pulled out my trusty America’s Test Kitchen (ATK) cookbook and got to work. I adapted ATK’s recipe a tad, mostly based on a children’s book my daughter picked out this week at the library. We’ve been reading it just about every day for a week. 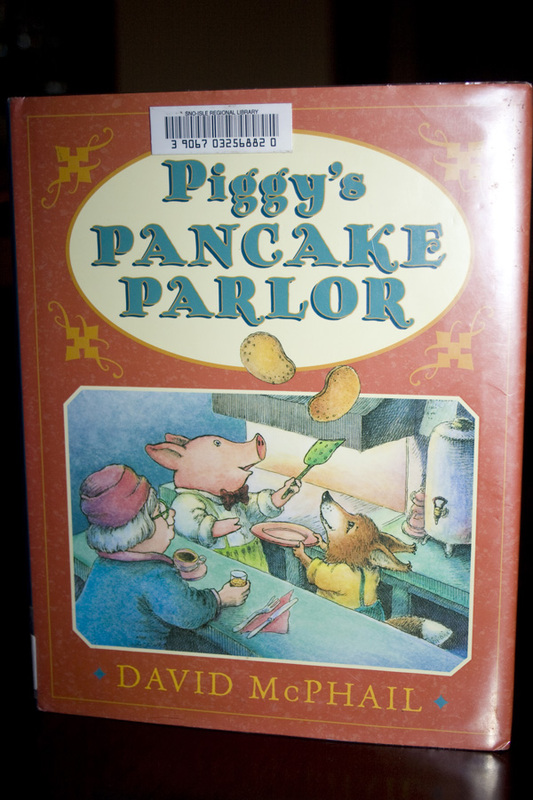 It’s about a runt pig who grows up and learns from the farmer’s wife how to make exceptional pancakes. He opens his own shop and has lovely adventures. When I announced that we’d be having pancakes for dinner tonight, my daughter asked if we’d be making them with the “secret ingredient” from Piggy’s Pancake Parlor – and of course, I had to give it a try. There’s actually two secret ingredients in this book’s recipe. The first one, I’ve been including in my pancakes for years (you’ll have to read the book to find out what it is…because I’m not telling). The second secret we added to this batch and is listed at the end of the ingredients. These pancakes were absolutely amazing. Light and fluffy, full of flavor and about the best stinkin’ pancakes I’ve ever had. I could become a breakfast person for these babies. A couple of things I did (based on suggestions from my ATK book) – make a sacrificial pancake. 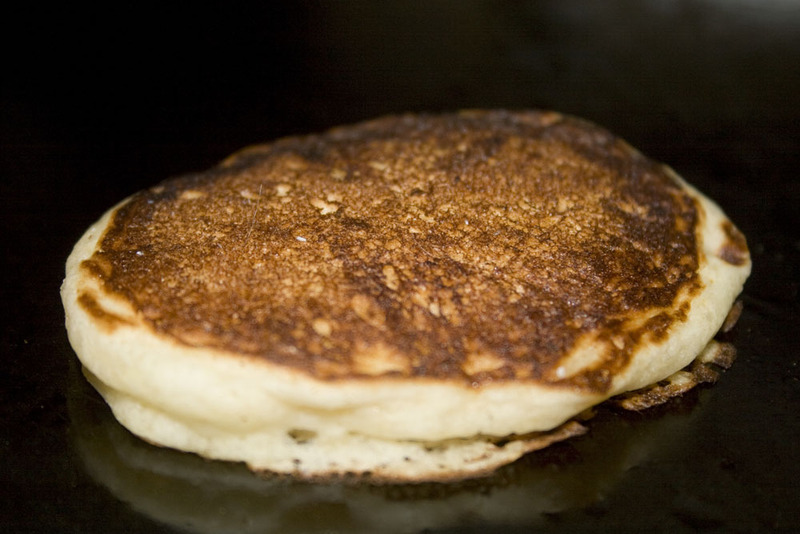 After heating up your griddle, make a tiny tester pancake to see if you have the right heat for your batter. Allow it to sit 1 minute, then flip – if it’s too dark, turn the heat down. Not done enough, crank it up a little. I always start at 350° and usually have to bump it down a little because the first batch of flapjacks cooks too fast. Doing a tiny one made it so I only wasted a teensy bit of batter…instead of and entire griddle full. Genius! The second tip is this. Absolutely do not overmix this batter. Stir the wet ingredients in just until the dry stuff is mostly combined. A few lumps or streaks of flour here and there and you’re done. Don’t attempt to get all the lumps out. The less you stir, the less time you have for the proteins in the gluten to sort themselves out. The more the gluten breaks down and develops, the tougher your pancakes will be. 1. If not using buttermilk, whisk milk and lemon juice in a medium bowl and set aside to let thicken. 2. In a separate bowl, whisk dry ingredients together – flour, sugar, baking powder, baking soda, salt and nutmeg. 3. Whisk the egg, vanilla and melted butter into the milk mixture. 4. Create a little “well” in the center of dry ingredient bowl and pour the milky mixture in the center. 5. Whisk gently until just combined, there should still be lumps. 6. Heat a pan or griddle to medium heat and coat with vegetable oil. 7. Pour pancake mixture by 1/4 cups and heat until large bubbles come to the top (about 1-2 minutes). 8. Flip the pancake and wait another 1-2 minutes. 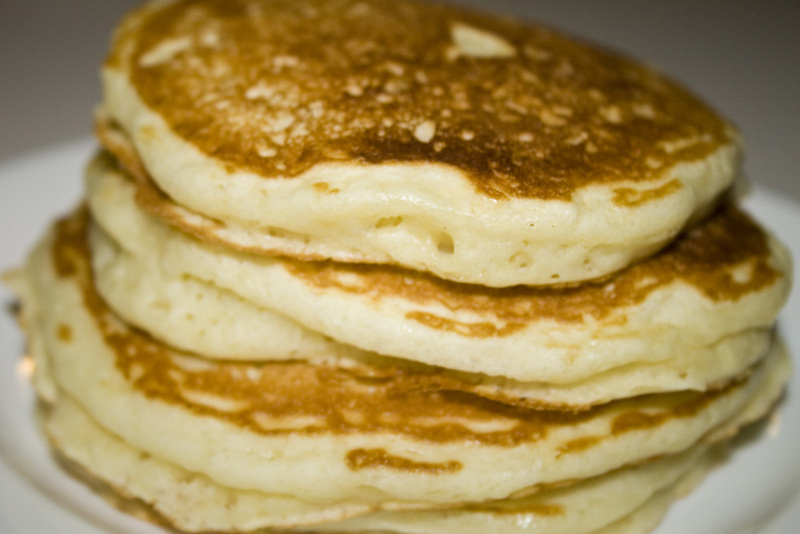 My favorite buttermilk pancake recipe is from ” The Cake Bible ” . It takes a little extra time because you beat the egg whites until they form stiff peaks ,then gently fold in . Also great with blueberries. We love this recipe. We found it when looking up a recipe because we loved the book so much. It is my family’s favorite that we use over and over again. Thank you!